Versatile operation - Eight separate heating elements allow transfers onto a variety of items, such as fabric, metal, ceramic, wood &glass. 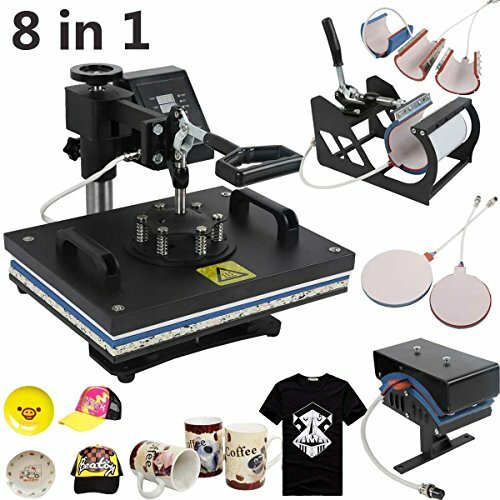 Create your own custom T-shirts, mouse pads, plates, coffee mugs, ball caps, tote-bags, license plates, and many other unique & fun items. Easy to use - Arrives fully assembled and ready to use (printer and paper not included). Swing-away design - This design is an improvement over clamshell designs, as pressure is directed straight down and is therefore more evenly applied;this improves the quality of the finished transfers. Full 360-degree rotation of swing arm; allows the heating element to be moved safely aside,reducing the chances of accidental contact. Digital LCD timer - Preset desired time and an audible alarm will sound when time is complete; helps avoid over exposure. Digital LCD temperature control - Set the desired temperature and element will stop heating when preset temperature is reached. Full-range pressure-adjustment knob - Easy to access, top-mounted control. This allows the pressure to be adjusted according to the thickness of the material you're transferring to. Teflon-coated element - Unlike other machines with bare-metal heating elements, all elements included with this machine, except for the cap press, are teflon coated. These surfaces are non-stick, prevent scorching of transfers, and don't require separate silicone/teflon sheets. The cap press is machined from high- grade aluminum, and due to its size, shape and design, it does not require special sheets either. Removable lower platen - Lower platform is elevated with dual supports; these allow room for t-shirts to be easily placed in. Hotronix Hover 16x20" Heat Press Auto Open MADE IN USA - Heat Transfer Press Machine Built To Last! TransPro Heat Press 15" X 15"
TransPro Heat Press 16" X 20"
Hotronix 11"x15" Heat Press Auto Open MADE IN USA - Heat Transfer Press Machine Built To Last!